Surgical Kits typically contain an assortment of surgical tools and items for a particular type of procedure or surgery. Surgical kits are needed for things like lacerations, life-saving surgeries (heart surgery, brain surgery, etc), cosmetic surgery's, exploratory surgeries, or many other procedure types. 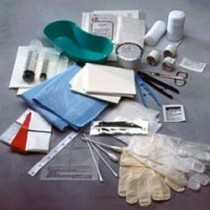 Hospitals need to have many surgical kits on hand for doctors and surgeons to have the necessary tools for their work. Doctors also will often carry surgical tools in an emergency bag in case they ever need to do emergency life-saving surgery. A few examples of surgical kits are: Laceration Kits with needles and other tools specifically for dealing with various types of lacerations. 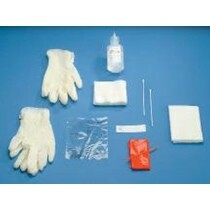 For removing foreign materials (shrapnel, etc) from wounds there are Debridement Kit with Scissors, Scalpel and Gloves.. These include forceps and other devices that will be useful for nagivating wounds and carefully removing any stray materials that have entered the body. 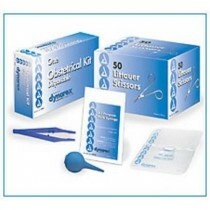 There are also Obstetrical Kits for use in childbirth procedures. 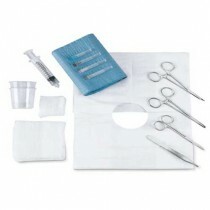 These surgical instrument kits include a few of the basic supplies a doctor will need to help with a delivery.